At the end of July, as the American wildfires began to take hold in California, British oil giant BP made its biggest financial deal in nearly twenty years. In retrospect it would have been hugely symbolic if one of the largest oil companies in the world, BP, which had so badly devastated the Gulf of Mexico eight years earlier with the Deepwater Horizon spill, had taken this moment to say it was investing in renewables. All you had to do was look at the flames burning – and listen to the experts saying this was climate change in action – to know that urgent action was needed. But BP did not do that. As Reuters reported, BP agreed to buy U.S. “shale oil and gas assets from global miner BHP Billiton for $10.5 billion, expanding the British oil major’s footprint in some of the nation’s most productive oil basins”. “I can’t remember when it has looked this good,” referring to the growth opportunities he saw for BP over the coming decade. What is a “world class” reserve of oil to BP, is “world destroying” to everyone else. It may look good to Bob Dudley, as long as he doesn’t look at the news regarding soaring temperatures and wildfires ripping parts of California to burnt shreds. Remember this is the company that promised to go “beyond petroleum” nearly twenty years ago. But still it just keeps on drilling. And here lies the disconnect the oil industry is in. No matter how many scientific papers there are warning about climate change, no matter how many scientists there are saying that climate change made this summer’s heat-wave twice as likely, no matter how many financial experts are warning about stranded assets and that the oil industry is risking billions of share-holders’ money, the oil industry carries on drilling. It is not as if BP doesn’t know the financial penalties of reckless oil exploitation: it is still paying off some $66 billion nearly in penalties and clean-up costs, related to the Deepwater Horizon disaster in 2010. The oil industry carries on burning money, oblivious that they are driving us all over a “climate cliff”. Since BP’s announcement, new scientific research about the dangers of positive feedbacks on climate change, which I blogged about here, and published in the Proceedings of the National Academy of Sciences, has received huge media attention. And rightly so. The oil industry is full of very well-paid people who should understand the science and risks of climate change. They may be rich, but they do not seem to be wise. 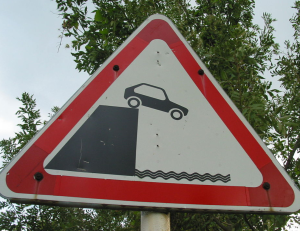 They drive blinkered towards the cliff.